The bog plants of Samaan Grove are diverse and are meant to clean surface water runoff. We also wanted to create a water garden that would improve land values and foster a good relationship between the residents and the natural environment. The following is a brief description of the plants you will find at Samaan Grove as of the date of this report. We will continue to search for other plants that are attractive and improve the effectiveness of the wetland system. We may also eliminate some species which become too difficult to handle. Rushes, Sedges. Throughout the length and breath of the island you will see rushes growing in conditions ranging from damp soil to drains with water depths of up to .5 meters (1.5 feet). They are very aggressive and will dominate any area. The only time we ever saw them recede was at the first wetland SWW#5, where the local rabbit grass dominated and eventually smothered the rushes. 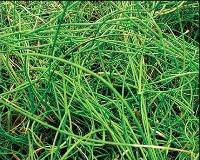 These grass-like plants of the Cyperaceae are better known by their more common name, sedges. Creeping rhizomes, three-sided stalks and an inflorescence composed of a series of scales (each one subtending an individual flower) characterize them. Corkscrew rush, Juncus effusus spiralis. We imported seeds from the US and gave them to Peter Moll at the San Antonio Nursery, Port of Spain, Trinidad, to propagate. It turned out to be one of the easier of the imported plants to grow from seed. Cattail, Typha latifolia. We have not yet introduced cattails to the wetlands because of their very aggressive nature. We plan to do so as the bog areas develop. They will grow in water depths of up to .3 metres (1 foot). Cattails produce extensive fleshy rhizomes, with stems growing to 2.7 metres (9 feet). They provide an excellent breeding habitat for many water fowl and cover for the more shy species. Swamp fern, Acrostichum aureum, grows all over Trinidad and Tobago. Plants appeared naturally and were not transplanted. They exist in the wetlands at Buccoo, Pigeon Point and at Tobago Plantations. American lotus, Nelumbo lutea. These plants were grown from seeds purchased on EBay. At first we had great difficulty getting the plants to grow. They developed a white fungus which enveloped the seed, eventually causing the new roots and stems to rot. We overcame this problem with regular water changes and were able to get a number of full sized plants. 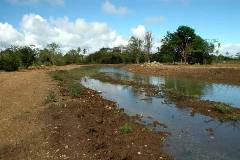 They were transported to Tobago and placed in the lake at Petit Trou Point at Tobago Plantations awaiting the completion of the lakes at Samaan Grove. We were delayed in getting the Samaan Grove ponds finished on time, and the plants eventually grew out of their pots and spread all over the deeper areas of the holding pond. At different times of the year we noticed a die-off of the leaves which, when first observed, caused us some concern. Within a month or two they would spring back to life, growing new leaves all over the pond. This new growth corresponded to the periods when there was a flow of fresh water entering the pond at the start of the rainy season. It has taken some time for the aerial leaves to develop as the waterlilies and rushes at the edge of this pond kept them in the deeper water. Eventually we were able to retrieve some tubers from the edge of the pond. We transplanted them into a pot in the Tobago office pond P-24 where they have done very well. We plan to introduce these plants next year in SWW#6. Purple Pickerel Rush, Pontederia cordata. We got these Pontederias from Peter Moll. The photograph at the right, taken in May 2004, shows the preparation of the area where we planned to place these wonderful bog plants. We added 15 centimetres (6 inches) of top soil to the clay pond liner to provide a good substrate for them to grow in. We chose to plant them right at the edge of the shelf as we were uncertain they would survive when not immersed. We placed 12 plants approximately 1 metre (3 feet) apart allowing room for them to develop and spread. The plants seem to love the conditions as can be seen in the picture below right taken in January 2006, eight months after planting. At the end of dry season in May 2006, when the water was at its lowest, we were pleased to see that they continued to do well. This shelf area dries out in the dry season with the pond dropping about .5 meters (1.5 feet), exposing parts of the shelf. What is especially good about these plants is that they make excellent habitat for the water fowl. Both common gallinule and black-bellied tree ducks have been seen with young in this area although no actual nests have yet been found. You can see the waterline clearly marked on the plants. Pink Pickerel Rush, Pontederia cordata pink form, has not done as well. The 12 plants we received were placed east of the purple in similar conditions. Perhaps because of their smaller size they seem to have problems with the water depth. We have since transferred some of them to shallower water to see if their growth rate improves. The picture on the right shows when they were first planted. After we started to lose some of the plants we transplanted one into a container at the office and it has done quite well. What is of interest is that when we transplanted both the purple and pink into the same container. The purple quickly dominated the space, forcing us to remove it and place it in a separate container. Once this was done the growth rate of the pink improved and the plant seemed less stressed. This may also be the reason that the pink did not do well in the pond. In order to help them through their first season we placed two pond tabs next to each of the plants regularly to give them a boost, after which they were left to fend for themselves.